The 1/2" Hole-Hawg Drill offers power and torque in a compact design that makes it perfect for drilling between studs and joists. The powerful motor features two speed ranges plus reverse for increased versatility. 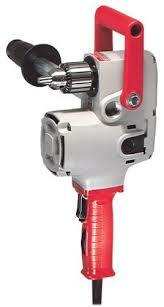 The drill offers a 4-5/8 self-feed bit capacity and an extra long pipe handle to help you control power. * Please call us with any questions you may have about our drill motor hole hawg rentals in Tacoma WA and Puyallup WA, serving the South Sound.